Vitamins C, E selenium & Zinc betacarotene bioflavonoids minerals. New One A Day formula. 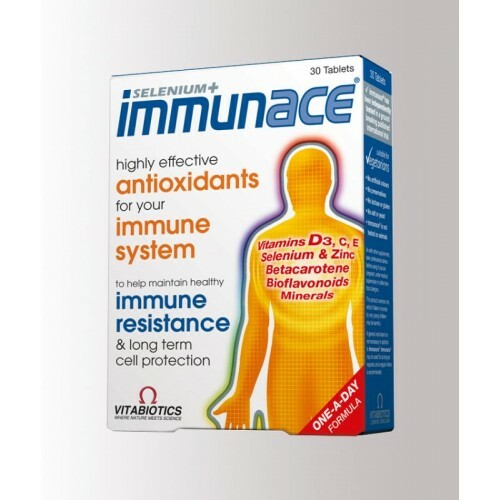 Nutritional support for your Immune system: Immunace provides a comprehensive formula for the immune system, with effective levels of antioxidants. Vitamins C and E circulate in the body to help protect against the damage caused by free radicals. Other nutrients such as betacarotene protect DNA and cells from within. Immunace helps safeguard nutrients required for: The short term - to help maintain your resistance against infection. It also helps replace the vitamin C lost during colds. The long term - to increase the body's level of protective substances for long term cell protection. Immunace provides vital minerals such as zinc and selenium which are co-factors in 300 of the body's antioxidant enzymes, Superoxide Dismutase (SOD), Catalase and Glutathione Peroxidase (GShPx). These eliminate harmful chemicals, including free radicals and peroxides. Nutritional Information Av. Per Tablet, %RDA. Nutritional Information Av. Per Tablet, %RDA. Vitamin A(2664IU) 800µg, RDA 100%. Vitamin D(400IU) 10µg, RDA 200%. Vitamin E 40 mg, RDA 400%. Vitamin C I50mg, RDA 250%. Thiamin (Vitamin B1) 18 mg, RDA 1286%. Vitamin B1214 µg, RDA 1400%. Pantothenic Acid 20 mg, RDA 333%. Vitamin K 70 µg, Iron 8mg, RDA 57%. Chromium 1mg, Betacarotene (Natural Carotenoids) 3mg, Cystine 4O mg, L-Caritine 30mg, Bioflavonoids 30mg. RDA = Recommended Daily Allowance. µg= microgram. mg = miligram. IU = International unit. No artificial colours. No preservatives. No salt, fat or yeast. Immunace is not tested on animals. As with other supplements, seek professional advice before using if you are pregnant. Breast-feeding or suffer from food allergies. This product contains iron, which if taken in excess by very young children may be harmful. Immunace can be continued for as long as required. 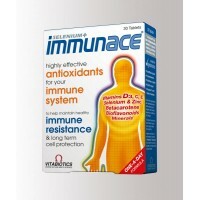 Immunace provides antioxidant support to help the body against the potentially harmful effects of excess free radicals. Immunace has been independently tested in a ground breaking published international trial. Advanced formula: The immunace formula has been developed in conjunction with international experts to antioxidant research.